Chilling Adventures of Sabrina is back and witchier than ever in its second season, which is now streaming on Netflix. Over the course of the brand new nine episodes, we see Sabrina Spellman (Kiernan Shipka) battle everything from a plague demon to Satan himself, all while trying to make sure she makes time for her mortal friends as her involvement in the Academy of the Unseen Arts grows larger (and darker). There's also the love triangle between her and high school sweetheart Harvey Kinkle (Ross Lynch) and new warlock love interest Nicholas Scratch (Gavin Leatherwood). In short: everyone's favorite bleach blonde witch deals with a LOT in season two. 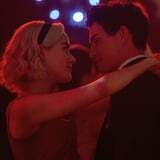 Given how the second season wraps up, though - with an emotional cliffhanger - it made us wonder: will Chilling of Adventures of Sabrina be back for season three? Thanks to Netflix, yes - it's definitely returning for a third outing! The show was actually renewed for both seasons three and four back in December, making it clear that the series has cast a spell not only on audiences but on Netflix executives as well. The streaming platform announced that the dark teen drama was renewed for 16 more episodes, which will be split between the next two seasons (officially called "parts three and four."). Series creator Roberto Aguirre-Sacasa celebrated the initial news saying, "Praise Satan! I'm so grateful to my partners at Warner Brothers, Netflix, Berlanti Television, and Archie Productions for supporting this darker vision of the world's most famous teen witch. And I'm thrilled to be continuing to tell Sabrina's chilling adventures with our incredible cast and crew, led by the unstoppable Kiernan Shipka."